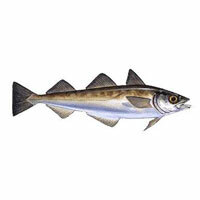 Theragra chalcogramma is called Alaska pollock or walleye pollock. Pollock and pollack are alternative spellings. The name Theragra fucensis has also been used. Symptoms:Helbling et al. (1996)  describe the symptoms of 39 fish allergic patients to 20 fish species. Only 2/39 specifically noted pollack as causing symptoms. However, pollack was third to anchovy and perch in the number of positve skin tests and after perch, sole, salmon and whitefish in the number of positive RAST tests. Thus symptoms for all 39 patients with fish can be listed as pruritus (27/39), hives (27/39), asthma and wheezing (21/39), angioedema (20/39), dyspepsia and cramps (7/39), vomiting (3/39), shock (3/39) and fainting (2/39). Food/Type of allergen:Helbling et al. (1996)  made an extract of Alaska pollack (and of anchovy, mackerel, rainbow trout, salmon and tuna) by blending 500g of raw fish in 1L of 0.01M PBS, pH 7.2, in a Waring blender for 1-3 minutes at room temperature. The mixture was extracted overnight at 4°C and centrifuged (70,000 g). Supernatants were concentrated with an Amicon YM1 filter (molecular weight cut-off 1 kDa) and recentrifuged (180,000 g). The extracts were sterile filtered and checked for sterility. Samples were diluted to 10 mg./ml. with sterile glycerol. 4 crustacea were extracted similarly except that the flesh was initially boiled for 15 minutes. Results were compared with 16 commercial extracts of fish as well as 12 inhalant allergens. Number of Patients:Helbling et al. (1996)  tested 35 subjects. Summary of Results:Helbling et al. (1996)  found that 18/35 fish allergic subjects gave a positive skin test to pollack. Van Do et al. (2004)  used extracts and purified parvalbumins from Alaska pollack and cod. Recombinant pollack parvalbumin was also used. Helbling et al. (1996)  used the same extract as for skin prick testing without sterile filtration or dilution with glycerol. Van Do et al. (2004)  used CAP FEIA and immunoblotting. Hamada et al. (2000)  used ELISA. Helbling et al. (1996)  used RAST and RAST inhibition. Van Do et al. (2004)  used tested 12 sera from patients with clinical histories of fish allergy and 3 control sera. 6 sera from patients with clinical histories of fish allergy, positive skin prick test, and CAP FEIA classes 4–5 were used for immunoblotting. Hamada et al. (2000)  used sera from 2 fish allergic patients. Helbling et al. (1996)  tested 21 fish allergic patients with pollack extract out of 39 total patients. Van Do et al. (2004)  report that the 12 sera were CAP FEIA classes 3–5. The concentration required for obtaining 50% inhibition of IgE-binding to cod parvalbumin was 18% higher for pollack parvalbumin than Gad c 1 itself. Recombinant pollack parvalbumin bound IgE 1000 times less strongly than the native allergens. Hamada et al. (2000)  tested fish meat paste products (kamaboko, tubular kamaboko called chikuwa, boiled kamaboko called hampen, square shaped fried kamaboko called satsuma-age, fish ball called tsumire and fish sausage) and surimi from walleye (Alaska) pollack. IgE from one serum bound only to fish ball. IgE from the other patient bound to all the products and was shown to bind to fish collagen. Helbling et al. (1996)  report a positive RAST with sera from 12/21 patients. This is similar to RAST results with several other fish extracts with the same patients such as bass (7/12), catfish (11/21), cod (8/12), flounder (12/21), haddock (8/11), herring (9/22), mackerel (9/23), perch (13/24), salmon (13/24), snapper (11/21), trout (11/22) and whitefish (13/24). However, extracts from anchovy (4/29) and tuna (5/27) showed fewer responses. RAST inhibition studies showed similar cross-reactivity with tuna extract as the least effective inhibitor. Immunoblotting separation:Van Do et al. (2004)  followed the procedure of Laemmli (1970)  with a 15% acrylamide separating gel at 200 V (Van Do et al. 2003)  . Immunoblotting detection method:Van Do et al. (2004)  transferred proteins onto nitrocellulose membranes (0.45 µm, Schleicher and Schuell, Dassel, Germany) in a mini trans-blot cell (BIO-RAD) for 1 h at 100 V. These were incubated overnight with 1:4 v/v diluted sera and IgE binding was revealed by antibody binding and BCIP/NBT (SIGMA FAST™). Immunoblotting results:Van Do et al. (2004)  show that all 6 sera bound to a band at 12 kDa in both pollack and cod extract. Purified pollack parvalbumin ran at this position and also bound the IgE. Helbling et al. (1996)  found that 18/35 fish allergic subjects gave a positive skin test to pollack and 12/21 gave a positive RAST. Thus reaction was slightly more common to pollack than to most of the 20 fish tested. RAST inhibition suggested strong IgE cross-reactivity between salmon, pollack, trout and tuna. Alaska or walleye pollack is the fish most sold by weight as fresh or frozen in the USA and perhaps second only to tuna overall (http://www.st.nmfs.gov/st1/fus/fus03/05_process2003.pdf). It is the fish most often used to make fish paste or surimi, although surimi is also made from cod (Mata et al. 1994 ). Surimi has been reported as a hidden allergen as both pizza topping (Helbling et al. 1992 ) and as imitation crab meat (Musmand et al. 1996 ). Musmand et al. note that surimi is used as an ingredient for imitation crab, shrimp, scallops, and seafood snacks and also surimi-meat blend products, such as “meatless” hot dogs, hybrid ham and bologna, sausages, pepperoni sticks, and pizza toppings. Characterization of parvalbumin, the major allergen in Alaska pollack, and comparison with codfish Allergen M.
Musmand JJ, Helbling A, Lehrer SB. Mata E, Favier C, Moneret-Vautrin DA, Nicolas JP, Han Ching L, Gueant JL. Surimi and native codfish contain a common allergen identified as a 63-kDa protein. Allergen epitopes:Not known. Bugajska-Schretter et al. (1998)  show that IgE binding to carp beta-parvalbumin is very much stronger in the presense of calcium, when the protein is in its native folded form, suggesting that the epitopes are primarily conformational. Nature of main cross-reacting proteins:There is clear IgE cross-reactivity between cod and Alaska Pollack parvalbumin. Van Do et al. (2004)  report that the concentration required for obtaining 50% inhibition of IgE-binding to cod parvalbumin was 18% higher for pollack parvalbumin than Gad c 1 itself. Van Do et al. (2004)  report a purification of native parvalbumin by anion exchange chromatography using DEAE cellulose equilibrated with 100 mM phosphate buffer pH 5.4. A step elution was used with 150 mM buffer and followed by size exclusion chromatography on Sephadex G-75. Analytical RP/HPLC showed two similar peaks and SDS-PAGE showed a single band. They also expressed two DNA sequences cloned using primers from salmon and cod sequences in E. coli (one cut short by a stop codon). However, the recombinant allergens bound IgE 1000 times less strongly than the native allergens. There are two families of beta-parvalbumin sequences in several fishes. One group includes Q90YK7 (Alaska pollack), Q91482 (salmon) and Q90YK9 (cod) and the other Q90YK8 (Alaska pollack), Q91483 (salmon) and Q90YL0 (cod). Each groups shares approximately 75% sequence identity and each sequence has 65-67% sequence identity with members of the other group. Q90YK7 and Q90YK8 are 67% identical.